October 6, 2010 - Garmin announced another major G1000 retrofit program. The King Air 300 and King Air 350 are expected to receive Supplemental Type Certificate (STC) for a G1000 retrofit installation in mid-2011. Once completed, King Air 300 and King Air 350 owners will be able to install the G1000 at any Garmin authorized G1000 retrofit dealer. With the completion of this STC, the G1000 will be available as a retrofit package for select King Air C90, 200, B200, 300, 350, and Cessna CitationJet aircraft. ?We have received a tremendous response to our G1000 retrofit programs,? said Gary Kelley, Garmin?s vice president of marketing. ?By installing a G1000 retrofit flightdeck, customers are able to completely revitalize their aircraft with state-of-the-art avionics capabilities and features that make flying safer.? The G1000 retrofit configuration for the King Air 300 and King Air 350 features two 10.4-inch PFDs and a 15-inch MFD, and can include many of Garmin?s newest G1000 features and capabilities. The G1000?s lightweight and modular design results in a typical weight savings of over 200 pounds compared to the previous avionics installation. 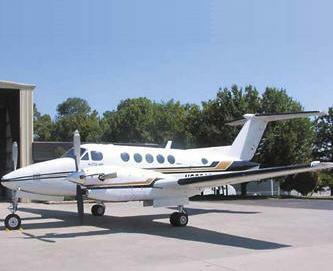 Garmin anticipates receiving the STC for the King Air 300 and King Air 350 in mid-2011. Garmin has established a select list of authorized G1000 retrofit dealers to sell and install the G1000 on the King Air. The G1000 is loaded with Reduced Vertical Separation Minimum (RVSM) compliant, the GFC 700 three axis, fully digital, dual channel, fail passive Automatic Flight Control System (AFCS) features roll, pitch and yaw control, integrated satellite weather datalink and digital-quality audio via XM WX Satellite Radio, fully digital airborne weather radar with horizontal and vertical scanning capability that includes WATCH (Weather Attenuated Color Highlight) and identifies deceptively strong or unknown intensity parts of a storm. Also included are dual integrated radio modules that provide oceanic, enroute, terminal, and approach approved FMS navigation with GPS/WAAS; VHF navigation with ILS; and VHF communication with 16-watt transceivers and 8.33-kHz channel spacing, and dual integrated digital audio control systems and dual integrated solid-state Attitude and Heading Reference Systems (AHRS), which can align while in motion, including in-flight dynamic restarts. Optionally - Garmin?s Electronic Stability and Protection system (Garmin ESP) works to assist the pilot in maintaining the aircraft in a safe, flight stable condition, and helps prevent loss-of-control conditions should the pilot become distracted, disoriented or incapacitated during flight. Synthetic Vision Technology (SVT) presents a 3D depiction of terrain, obstacles, traffic and the runway environment on the G1000?s PFD so that the image replicates what pilots would see outside the cockpit on a clear day. Garmin?s GSR 56 Iridium datalink and GDL 59 data logger and Wi-Fi datalink are independent systems that offer features like worldwide weather, voice communication, text messaging and data communication. Integrated Class-B Terrain Awareness and Warning System (TAWS) with worldwide terrain and obstacle database, which does not require an external LRU as with other TAWS systems. Class-A TAWS is available as an option.